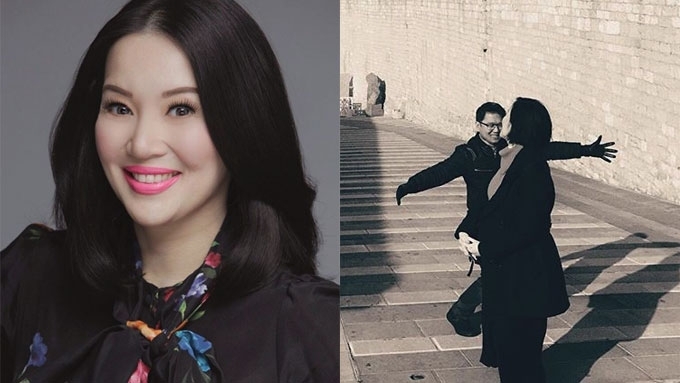 Kris Aquino banters with Mayor Herbert Bautista about marriage: "Kailangan may pre-nup!" 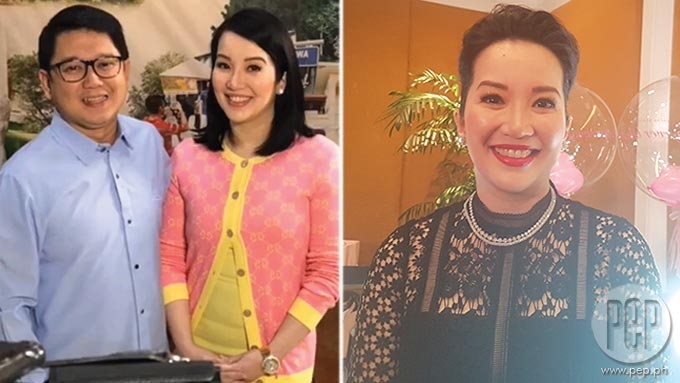 Kris Aquino on playtime with ex-fiance Mayor Herbert Bautista on the day Yaya Raquel was wed: "Pinapatawag niya yung judge. Hahaha! Sabi ko sa kanya, 'No! You have to meet with Atty. Sigfrid Fortun. Kailangan may pre-nup! Hahaha!" 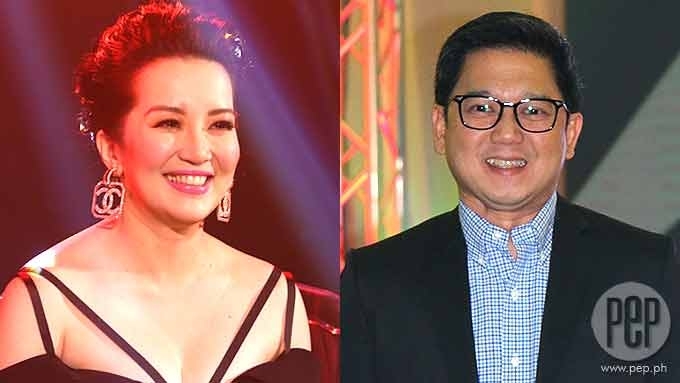 Kris Aquino says she and Quezon City Mayor Herbert Bautista are on such good terms today that, one year after she turned down his second marriage proposal, they can joke about marriage without the awkwardness. 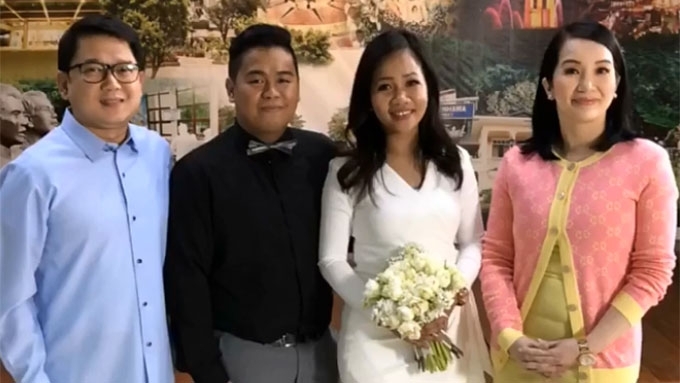 Such was the case when, Kris narrates, she and Herbert met up at the civil wedding ceremony of Kris’s Yaya Raquel Luntayao and her groom Junaries Confessor. Mayor Herbert officiated at the wedding ceremony held at Quezon City Municipal Hall last January 10. Speaking to PEP.ph (Philippine Entertainment Portal), Kris recalls that, on the same occasion, Mayor Herbert made a play of acting like it was he and Kris who were to be wed.
“Pinapatawag niya yung judge. Hahaha! Sabi ko sa kanya, ‘No! You have to meet with Atty. Sigfrid Fortun. Kris also says that she and the mayor actually had a conversation about the public, which had generally been disapproving of their romance when it was happening. “Sabi ko, ‘May ka-weird-uhan ang mga Pinoy. Ngayon, gusto na nila tayo together! Hahaha! But when Kris talks about the real score between her and the mayor today, she says they're just friends. Explaining herself, the high-profile celebrity says, “I think, kasi, there are people na dapat i-friend mo na lang. Dapat i-friendzone niyo ang each other. Kris spoke to PEP and a select group of entertainment reporters at the launch of her latest endorsement deal—the Filipino makeup brand Ever Bilena—held at the EDSA Shangri-La hotel, yesterday, January 27. THEIR LOVE STORY. Kris and Herbert’s love story go back to February 11, 2014, or on the second night of airing of Aquino & Abunda Tonight, the now defunct ABS-CBN late-night talk show hosted by Kris and Boy Abunda. According to Kris's blog post, dated February 2015, Herbert went into her Aquino & Abunda Tonight dressing room and asked for her mobile number. What followed after were secret dates—of Kris and Herbert watching movies, eating burgers, and chatting in the car in the parking lot of their favorite coffee shop. It culminated with Herbert proposing marriage to Kris “on the first Friday of April” of 2014. Kris wrote in the same blog post that she was elated with Herbert’s first proposal, but that it was he that broke up with her just days after. On January 22, 2017, or three years after their short-lived romance, Mayor Herbert gave her a diamond ring and proposed to her a second time, this time in Italy. Kris said that she accepted the ring, but that she returned it to Herbert the next day. "I really realized na, parang, I think wrong timing. "When he was already ready, I felt ang dami ko nang na-survive. At ang tagal din naman kitang hinintay." In a separate interview with a magazine in December 2017, Kris got into the same topic, saying she turned down Herbert's second proposal because "responsibilities that came before he and I met" had to come first. CLOSING HER DOORS? 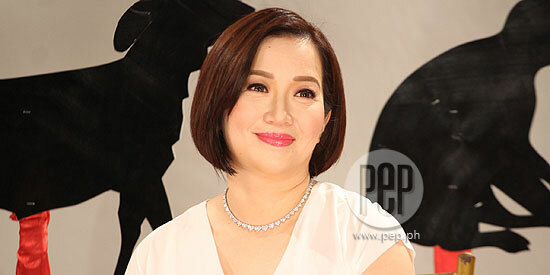 In PEP's interview with Kris yesterday, January 7, we ask: Is she closing her doors to a romance with Herbert for good? “Tinitimpla ko, kasi di ba, it will haunt me? Whatever I say now will be replayed. Fact is, for all of Kris’s talk about her and Herbert being just friends, Kris's followers have always said that the two could get a third shot at love. Both are not married at this time and seem not to have current dalliances; both have children—Kris has two by two different men, while Herbert has four by two different women; and Kris has a habit of teasing the public about Herbert, who does not seem to object. Most recently, her followers were greeted with a throwback picture of Kris and Herbert's meet-up at the Basilica of St. Francis in Assisi, Italy, from January 22 of last year. Kris posted it on her Instagram account January 23 of this year. If you check your phone (i’m not sure if it’s the same for Android ones) BUT for iPhone photos, there will be MEMORIES, and “ON THIS DAY” will show pics for that day from your cloud. This picture was there last night, i was photobombed outside of the Basilica of St. Francis in Assisi ????... I hope my friend @iamgarygarcia can recall the exact number of places of worship we prayed in that Sunday, January 22, 2017... I’m sure we went to more than 10 Churches & chapels in Assisi & Rome w/ Gary & the mayor’s closest friends since his youth. I’m sharing this picture now because Mayor Herbert & i have a weird & special friendship & this 1 picture represents to me perfectly who & what we are to each other. He took that free day from the 2017 peace talks to give in to my wish to really pray in as many Churches as possible... I texted him last night to share good news about new endorsements. And I THANKED HIM- because he prayed w/ me when my 1 prayer was to just be given a chance to say goodbye properly to a career i loved passionately & for God to heal me w/ the gift of becoming OKAY again... I dared not even pray for more-just for acceptance in where my life was then. But in surrendering to God’s plan, He totally RESTORED my life. A year after that day of quiet, private prayer w/ a REAL FRIEND, let where i am 366 days after be proof that we just need to have enough FAITH to let go & let God. #gratitude ???? Asked about their sweet throwback photo, Kris explains that it was more about being grateful to Herbert for being there for her when she was suffering a major career crisis. Kris elaborates, “Only because—I don’t know sa phones niyo—lumilitaw memories that day, and it came out. “And I distinctly recalled talaga na sobra-sobrang pagdarasal ang ginawa ko. “At that point, there was nothing. “There was really, parang, so many plans had been hatched that didn’t push through. Since then, Kris has apparently moved forward, carving out a niche in a new, ever-expanding market: the digital platform. Kris continues, “And then I realized, I told him, 'Do you realize na yung pagdasal na ginawa natin na yun, sobra-sobrang sagot na binigay sa akin? “'And, I think, you’ll always appreciate the person who was there when you’re at your lowest. “'But also, that doesn’t erase the fact that you also broke my heart.’"
Laughing at her own candor, Kris adds, “I mean, di ba? I am being honest. THE PENALTY CLAUSE. Kris now also reveals an important factor in the failed romance that showbiz insiders have suspected all along. Marrying Mayor Herbert would have meant being penalized by the multinational companies Kris had big endorsement contracts with. Kris admits, “I think beyond that, one is, to be perfectly honest talaga—several contracts have provisions that, if you end up with an elected official, may penalty. “Because of the money trail, it will appear that they are paying somebody in elective office." This was not the case in her relationship with her brother, Benigno "Noynoy" Aquino III, a long-standing politician and the country's highest elected official from 2010 to 2016. “Dati kasi nung kay Noy, okay yun, kasi hindi conjugal, e," Kris explains. "Magkapatid kami but we shared nothing. "Sauli! At hindi lang sauli, ha? Clearly, marrying Mayor Herbert would have been costly for Kris, who counts 40 existing endorsements, with two more coming in the next few days. KRIS KEEPING IT REAL. It doesn't help the romance that Kris entertains doubts about Mayor Herbert's readiness to make a lifetime commitment. “Alam mo, I don’t think he’ll ever be ready. She rests her case with the example of her own brother Noynoy. “Hello? How old is my brother? Perfect example! He is turning 58. Noy will be 58. Hello? Never kinasal. “So alam na alam mo na. Kris also says she is just glad that, through the four years she and Herbert have been friends, they have overcome a broken engagement and a rejected second proposal and still remain friends. “And alam ko, kilala ko na siya, e.
“Pag kaya na niyang magbiruan nang that way, alam niyo na talagang yun na yun. Kris Aquino's Yaya Raquel is finally married!